Entry filed under: Newsletter, Quilting. I love Scooter! I like the video of him working his way onto you lap the best and I will be watching for him on cutest animals. Must be the week for plumbing, not quilting. Hot water heater flooded my garage. Rather be sewing. Good dog Scooter, guard that refrigerator. Hopefully the water from the hot water heater rolled out of the garage and down to the street, Tonie. Still sounds like a mess you didn’t need. Cool, Jean! Did you sew them by hand or machine? I sewed them by machine except for the hole to stuff. That was hand stitched. They were given to babies, the pet idea is a good one too. Good for you. So many quilters shy away from “set-in” seams. This project is a nice ramp up for that. And my dog isn’t getting one, unless I can sew it out of Tyvek. You can get tyvek easily. It is used to make envelopes. Try the U.S. Post Office or any office store. Yes, but it’s nasty to sew patchwork with. Jets makes an 8 corner pizza. Brilliant. Lisa, that’s what they advertise, but they’re still rectangular and unless you tell them, they cut it in 6’s around here. Good, but not nearly as good as Ruggero’s. So exciting Scooter, and Mom! TV….the big time, you will wow them, I’m sure. Will watch for it. Didi, it will be my 45 seconds of fame. Can’t wait! It could have been worse, you might have been on a tour. Constance, thank you for feeling my pain. :) Yes, it could have been WAY worse. That’s quite a compliment coming from Miss Rhonda! Tuning up your vocal chords for the booth in Houston? Always look forward to receiving your newsletter. It is light hearted and consistently informative. Scooter’s antics are an added bonus. I keep looking for the “like” button, oh, yes, that is Facebook. I have always enjoyed your newsletters. Thank you, Jean! It feels great to be liked! When I send a quilt for a new baby, I sometimes send a bigger fabric ball, maybe 7″ or 8″ in diameter, for an older sibling. In addition to the usual hand-sized balls, I have made smaller ones, with about 1″ sides, and filled them with rice for my juggling friends. I warn my friends not to let them get wet, or they may be juggling with lunch. I look forward to your newsletter every month. Thanks for sending it. Anne, thanks for the suggestion on Ginny’s book. I haven’t seen that one. Rice, huh? Someday I really do want to learn how to juggle,but I’m not very coordinated. Glad you enjoy the newsletter. I feel for you and you made my day as I too have had things go wrong but I always find a way to put humor with it.!!! 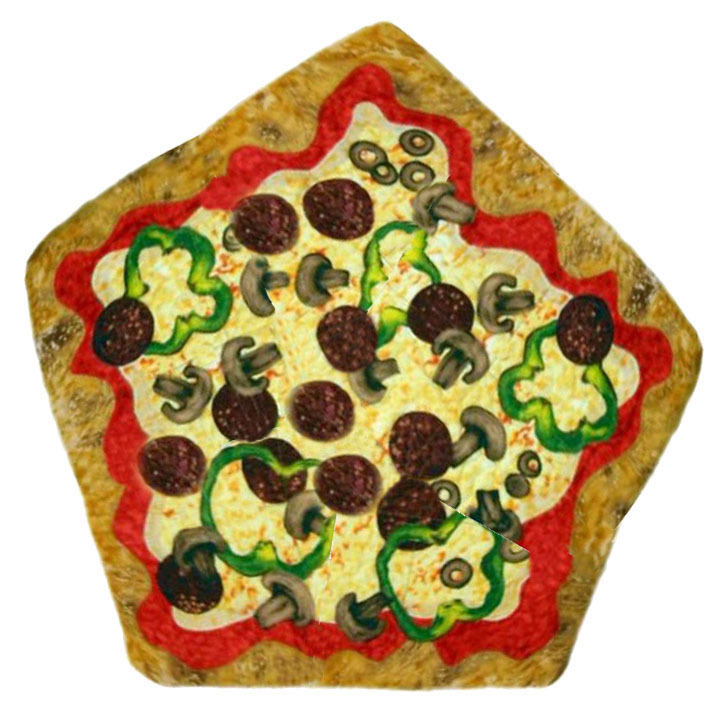 Now about that pizza would 4 inch mini pie pan pizza be better ….crust all around…..hmmmm!!! Love your outlook on life and sense of humour. Keep it coming! Guard the fridge, Scooter. NOT! Too funny. Just an observation for you… Ever been to Pal’s diner in Flint? It made its long journey from Mahwah, New Jersey near where I grew up. I had many, many meals there after football games and late night dates during HS and college!! I am now a midwesterner (Chicago suburbs) and look forward to your visit to our guild in Lockport. Jeanne, you’re the second person so tell me about Pal’s. The other person answered a computer software help line a few months back. I’ve never heard of it and have lived here for 35+ years. Where is it? Maybe you’ll have to draw me a map when I come to visit your guild. Just an observation for Jeanne Turnock and Ami. Have you ever eaten at Toni’s at the Birch Run exit on I-75. The bacon, lettuce and tomato starts with 1 (one) pound of bacon. Yum. I would do a day trip from Cincinnati just to eat at Toni’s. Once. Nailed me right to the chair. 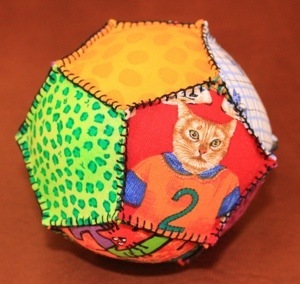 Oh gosh… not sure how you missed the Fabric Ball fad – back in the early 2,000s? When JInny (with a J) Beyer’s book came out, I was learning hand quilt piecing… and fell in love with all her work. Ya gotta watch her video showing her hand piecing technique… no one, and I mean NO ONE (well maybe those Japanese gals with the tiny hands that win all the awards in handmade quilts every year now at Houston!?) can sew a line by hand as fast as that gal…her technique is flawless… but her book is THE fabric ball bible… http://www.jinneybeyer.com. I’m sure you’ll be hooked! I have them all over my house. I think you were busy makin those fabulous jackets back then eh? I love it all… especially keeping up with Scooter! My readers always know best! And I should have caught the Jinyy (not Ginny). I’ll have to watch videos now too! If I remember correctly I think Jinny quilts with both hands (although not at the same time). What a treat each time I see the newsletter in the email box…always hoping for a Scooter video. Double knit polyester? Great idea, if I could stand to touch the stuff. Probably wears like cast iron. Scooter MIGHT get one of those. Sorry you were snaked. But from the roof!? You sure the “pro” wasn’t pulling your leg. I will spare you all the anatomically disgusting comparisons that just went through my mind. Love the ball idea. I could stuff it with the thrums from my weaving. Using scraps from both crafts/very satisfying. Mary, that is a “thrum” and how did you come to have one at your wedding. The only “thrum” I know is the digit on my hand that’s not a finger. Or is this a musical reference….something you do to a guitar? I can always count on a LOL moment when I read your blog. For anyone who hasn’t had the opportunity to attend one of Ami’s lectures, run…don’t walk to get a seat if you have a chance to go! Thanks for sharing your unique and very entertaining insights. Betsy, you are so sweet. Thank you! YOU find me unique and entertaining. My family just rolls their eyes. Ami, You are too modest. Your dinner/talk at Pigeon Forge, TN at the 2013 Mountain Quilt fest left your audience in stitches from all the laughter. Oh my gosh, that was a great crowd! Tell them I want to come back! I’ve been making pentagon baby balls for 38 years now, as my signature baby gift to family and close friends. My first pattern came from a 1975 issue of a magazine called Mother Earth News. I do them totally by hand and I use black dmc #8 thread and the buttonhole stitch on all the outer edges. I use a variety of bright colors and prints. It is my handwork wherever I go. Ginny has a cute stuffed football too. My guys throw it at the TV and use it as a neck pillow. I’vve made red, white and blue, and a couple to match team colors. I love this kind of stuff. Barb, those sound adorable. Care to share a picture? If you want to learn to juggle, try to do it with three small scarfs. That “should” help. Thanks for the tip, Mary Ellen, but if I want to learn to juggle I will need to start at birth. Go to Comcast.com on your computer, plug in your town and zip code, look at the schedule for the day Scooter is going to star and you should find the time and channel with no problems. We are putting an apartment in our basement for our daughter and one day my husband found the two toilets upstairs had backed up and had filled her new soaking tub with “stuff”. YUK!!! Water on the floor, actually everywhere. He had to dig out the drain to snake it and clean up the mess. When daughter came home from work she almost cried because she still hasn’t been able to take a bath in her new soaking tub. Poor thing. my pentagon balls are crocheted, been doing it for many years. also put in a whiffle ball that i insert not one, but two jingle bells for a pleasing sound. 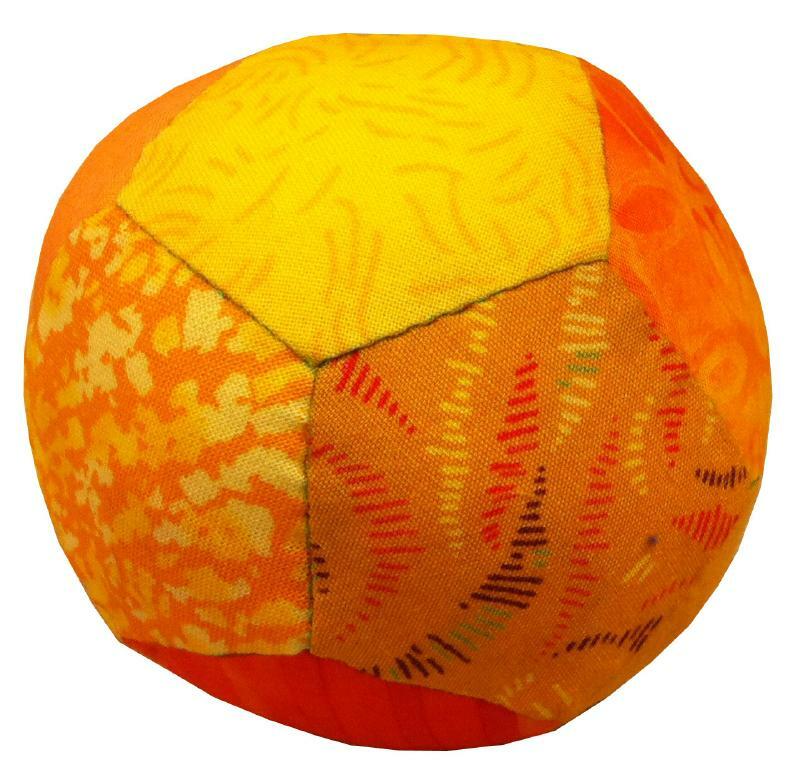 the slit in the plastic ball does not easily come apart and everything remains washable. Marion, you crochet them? How cool is THAT!? Send me a picture? I think I may have to do one of those… You guys are all so clever! I’m glad Scooter’s going to be on “America’s Cutest Pets”. My honey and I watch that show all the time. Good luck with your basement. Andrea, so when does it come on where you live? Is it every week? Hi, it’s the quilt goddess from Davison–Scooter lays by the frig because there’s warm air that comes out. It’s great for drying wet tennis shoes. Ah….not so much the warm air. It was June when I filmed it and I think he was just really, really tired. Oh, Ami, we had our sewer back up in the basement last year–twice! Snaked it both times and sent down a camera that revealed a gap in the line. Had to excavate the driveway. Ouch. Anyway, something better than bleach for your basement is OdoBan. It kills germs just as well but doesn’t harm surfaces, and it comes in pleasant scents. The company that cleaned our basement used it, so I bought a gallon at Home Depot to wash and disinfect some towels that got nasty sewer water on them. You’ll find all kinds of uses for it, and it doesn’t cost a fortune! No affiliation, just a relieved user. Good luck! Phyllis, I have about 3 inches left in a gallon jug of OdoBan. It’s at least 10 years old. I got if for “puppy accidents.” Works great! Didn’t even think of that! As for the gap in the sewer line, no thank you! When my son (now 38) was 3, and it was the first year we had him (he’s adopted), I bought him a soft knitted ball (it was knit in sections like a beach ball) at a church bazaar and put it in his Christmas stocking. It was stuffed with old nylons, and soft and squishy. He really enjoyed playing with that and could throw it in the house without getting into trouble! After his first son was born, I washed it and sent it to him for His first Christmas. I have no idea if Isaac still has it; if so, it’s in Oklahoma now…. Charlotte, what a cool story! Meaningful things created by our own hands and treasured for decades. That’s what it’s all about. Warm fuzzies for everyone! Oh I wish it were a Beverly Hillbilly gusher. Thankfully, as of this morning, it’s 98% cleaned up. And I’m leaving town tomorrow! I have made the ball as well. It was a great first ball for my baby granddaughter! Sewed it by hand since it was such a small project. Stuffed it with leftover cotton batting pieces. I enjoyed the handwork, but when I realized it was so much faster by machine, well…. you know. Everyone. I enjoy the newsletter and all the comments and Ami’s replies. Keep up the good work. So far no plumbing problems. Keeping finger’s crossed because house is getting to be 30 and we all know what happens when you age, things stop working. Staying inside in Virginia’s 90 degree heat and reading all the posts. Love this format. I like to be able to talk back! I have a set of go to baby gifts, burp cloths, bibs with velcro and my version of a snugglie a 10X10 square usually of flannel with ribbon loops on edges to play with. 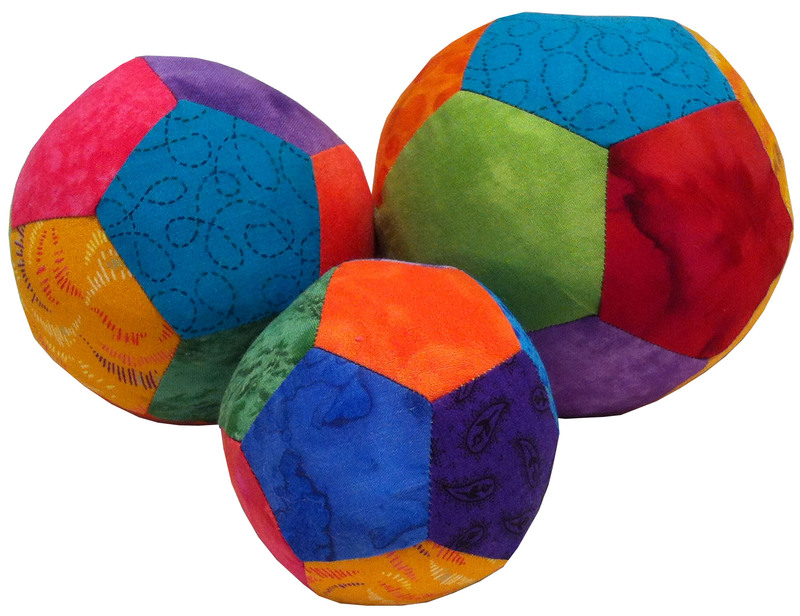 So now I am gong to order the ball pattern to add to the set, I love having something handmade to gift even when I am not doing a quilt. Thanks, Mary Ann! And I like the format too. It’s great to be able to comment to a comment, instead of just adding my 2 cents at the end. Yeah! Leslie, I printed your wonderful comments so I could stick them on the fridge. Thank you for your kind words, friend. Now that I look on the calendar I’ll be teaching in St. Louis. I’ll have to go check that out, unless somebody beats me to it. (Hint, hint.) Still packing. A number of years ago, I made candy or gift ‘balls’ out of the pentagons. I’d cut out 12 pentagons of the outer fabric (either a pretty cotton print, or else a glitzy collections of silks and satins), 12 lining fabrics, and 12 fusible fleece pentagons (minus seam allowances) . Each pentagon was made into a unit, fusing the fleece to the outer fabric. Usually I’d stitch four of the sides of the pentagons, right sides together, leaving one side open to turn the unit, and then slip-stitch the opening closed. I’d blind stitch 11 of the units together and the 12th one (the top unit) would be attached on only one side, creating a lid. After that, the sky was the limit on filling them … using Christmas prints, all different, and filling it with Christmas M&Ms; creating a very glitzy one and filling it with bath oil balls or dry bath salts for a powder room; and the favorite one for a candy shop owner I knew was to line it with tissue and then put in a dozen or so tiny chocolate truffles. That last one was a big hit as a hostess gift. …. hmmm, maybe I need to make more of these again. Yes, you do need to make more….so we can see them! Thanks for the pentagon ball idea… I will make some of those for the grands. I am ready to quilt my spools quilt, and can’t remember seeing how you did the quilting. I do NOT what to quilt over those amazing spools…. can you help me out ???? 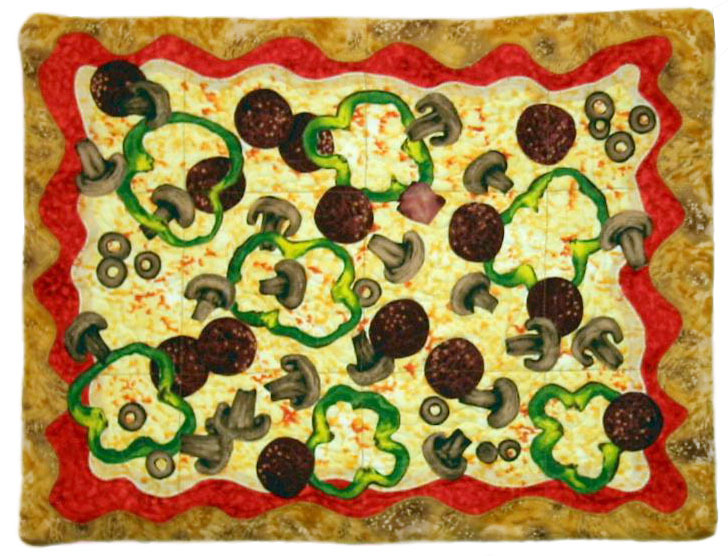 I haven’t quilted mine yet, but take a look at the Dancing Spool quilts over on my web site for some quilting ideas. You will have to quilt a little over the spools to nail the batting.